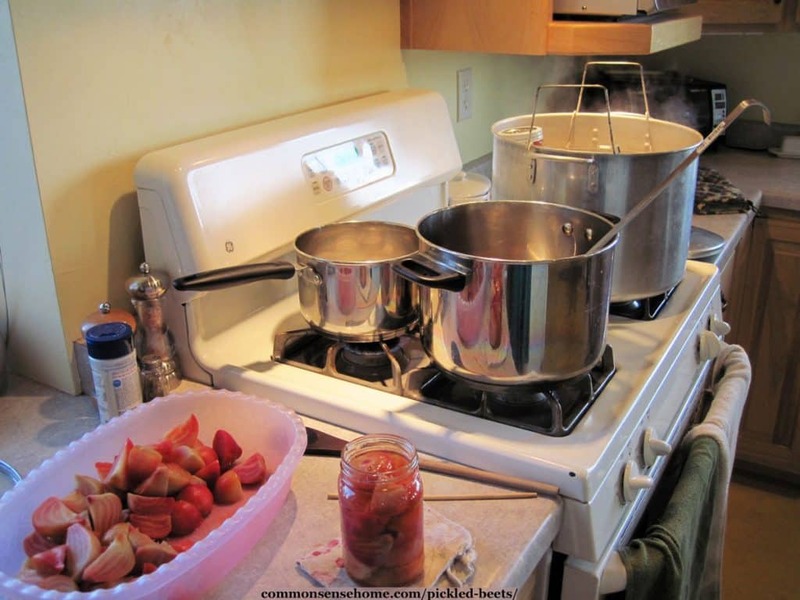 When I was growing up, I remember many afternoons of sitting on the porch steps with a canning kettle full of steaming beets, peeling off their slippery skins to get them ready for pickling. Although they been cooked, drained and covered in cold water, they could still hold a lot of heat, so tender fingers needed to toughen up in a hurry. (My boys still squawk about how hot I keep the dishwater. I think they need to peel more beets.) Soon the canning shelves would be filled with jewel-like red jars. There was always a jar of pickled beets in the fridge on hand for meals, and for the holidays they'd be served up in a fancy crystal dish. Mom always canned up a big mess of beets each year, but I rarely made pickled beets since no one in the house would eat them except me. Fast forward, and my eldest son has decided that he loved beets. Given that he's built like a linebacker, he can go through quite a few of them, so I figured it was time to dig out the pickling spice. Here's momma's recipe. It's similar to the Ball Blue Book “Beet Pickles”, but a little simpler on the spices. Sterilize jars, fill water bath canner, prep canning area and lids. I like to heat my lids in warm water, which was previously recommended by Jarden. With the current lids, they say that heating the lids is now optional. Never boil your lids prior to canning. This may lead to seal failure. Here's my canning set up. I like to work from left to right. My canner sits on my highest power burner at front right. The lids stay warm on the back left burner. I keep the brine on the front left burner, and fill the jars to the left of the stove. Once processing is finished, I place the jars on a clean cloth on the counter to the right of the stove and allow them to rest overnight or until completely cooled. While the beets are cooking, prep your pickling liquid so it has time for the spices to infuse. To make your pickling liquid, combine all ingredients except beets in a large sauce pot. Bring you vinegar water mixture to a boil; reduce heat. Simmer 15 minutes. Remove cinnamon stick. Before canning your beet pickles, you need to cook the beets and remove the skins. You can do this by boiling or roasting. 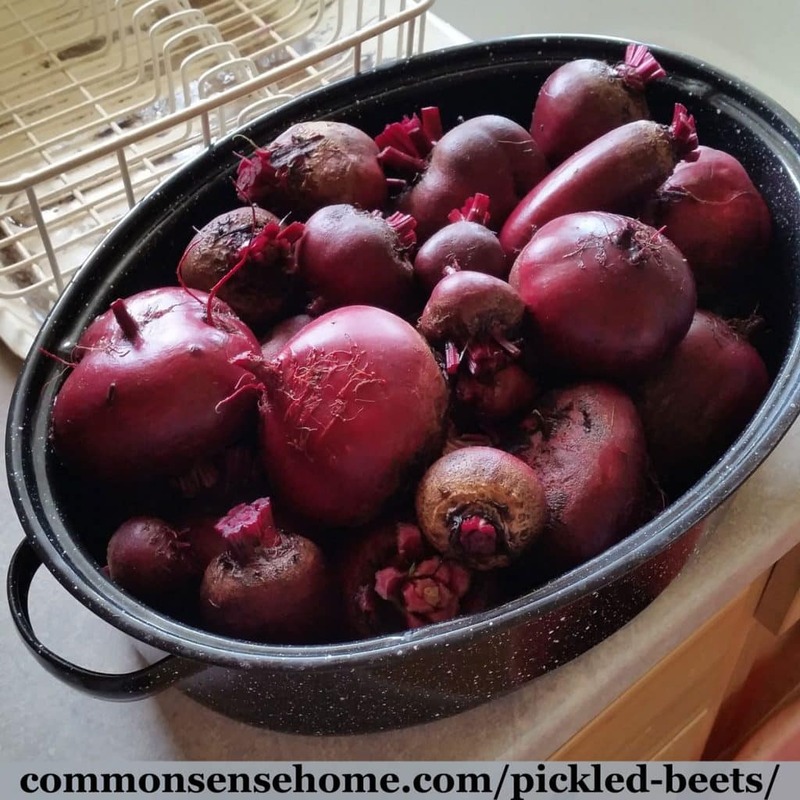 Mom always boiled hers, but once I roasted the beets instead of boiling and was hooked. We'll review both boiling and roasting and you can choose what works for you. Before cooking, wash fresh beets and trim tops to about 1 inch. To boil beets: Place beets in a large stockpot with water to cover. Bring to a boil, and cook until tender, about 15 minutes to half an hour depending on the size of the beets. If beets are large, cut them into quarters. Here are the beets before and after boiling. Note the color change and how you can start to see the skin is starting to separate from the flesh of the beet. They should be tender enough to pierce with a folk. To roast beets: Place cleaned beets into a large roasting pan. Cover with lid and bake in a 350°F oven for 1 to 2 hours. (Very large beets may take longer.) When ready, beets should be easy to penetrate with a fork. To remove the skins: Drain boiled beets, remove roasted beets from oven and take off lid. Let cooked beets sit until cool enough to handle (or cover with cool water to speed up the process), then remove the skins. They should slip off easily, with just a little help from a paring knife on stubborn spots. 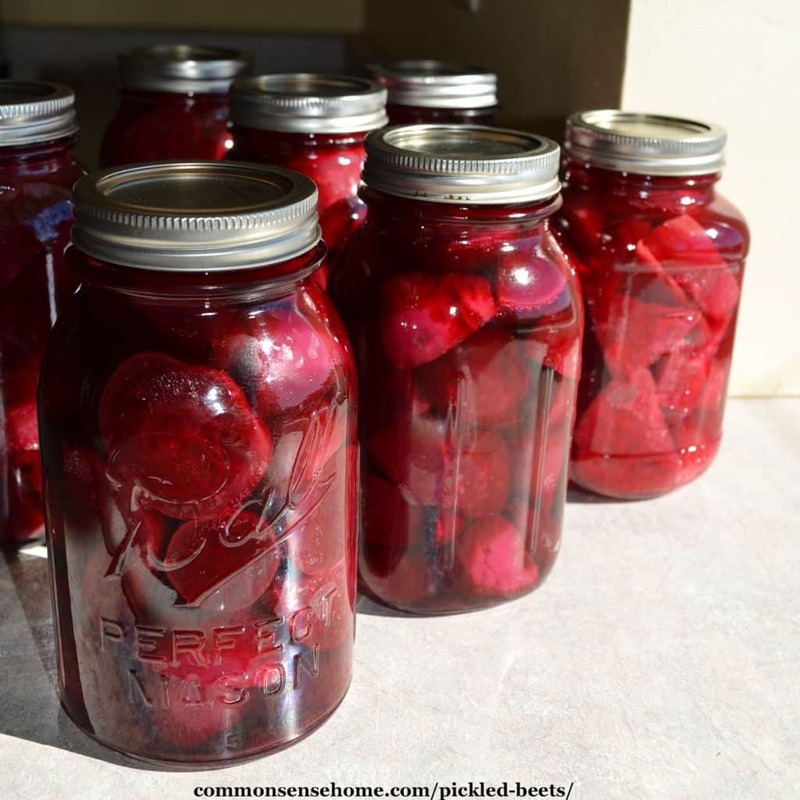 Slice beets into evenly sized sections so they fit in the jars more easily. Here are my beets, ready to go in jars. These are heirloom Chioggia beets, which when raw have red and white candy cane patterned stripes. After cooking, they look more golden/orange. With the addition of vinegar during canning, they turn pink. I found them a little more visually interesting than your typical red beets. Pack beets into hot jars, leaving 1/4 inch head space. Ladle hot pickling liquid over beets, leaving 1/4 inch headspace. Remove air bubbles with a thin plastic spatula of chopstick. Never stick a metal knife into your jar because you can cause scrapes or nicks that may lead to jar failure. Wipe jar rims and screw on two-piece caps until finger tight. Process pints and quarts 30 minutes in a boiling water water canner. Jars ready to lower into the canner. I was a little short of my six pints with this harvest. It's fine to double the recipe if you have more beets to can. Remove pickled beets from canner and place on towel on counter top to cool. Once cooled, remove the rings before storage and wipe any spills or drips. Label the jar lids with the date and contents and store in a cool, dark location. I use a sharpie marker and store mine in the canning pantry or upper shelves in the root cellar. 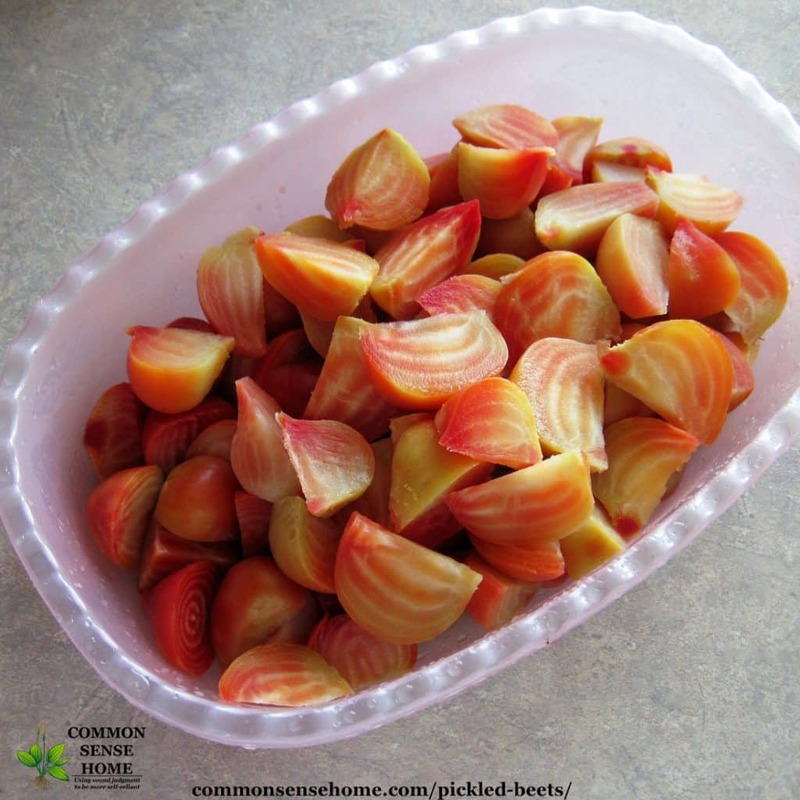 The Chioggia beets turn from striped to pink after pickling, as shown in the photo below. The top and bottom photos in the post show quarts of red pickled beets. If for whatever reason you don't want to process these in a canner, they can be refrigerator pickled. Simply place jars in the refrigerator instead of processing. Let them sit for a couple days before eating to allow the flavor time to sink into the beets. You may want to cut the batch in half to save on fridge space. 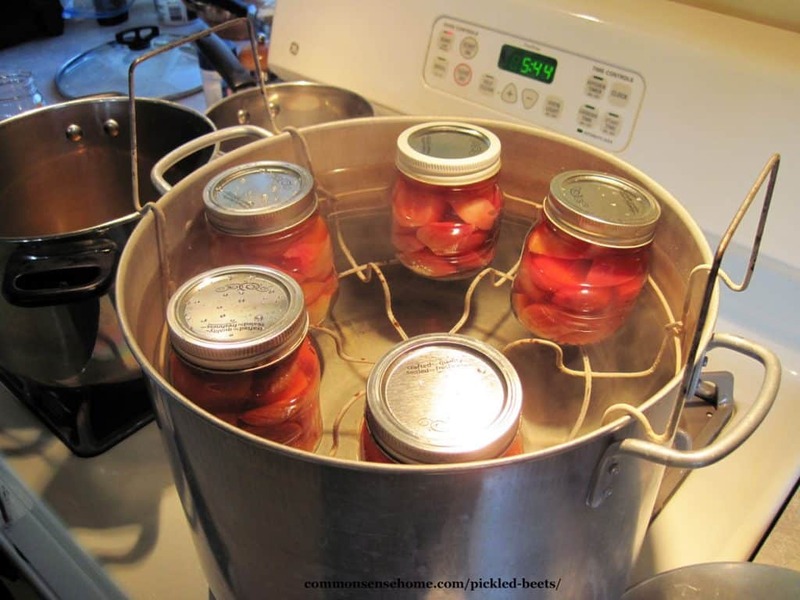 Jars that are not processed in a canner cannot be safely stored at room temp. 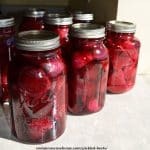 Gram Irene's Pickled Beets – This easy recipe delivers old fashioned flavor with safe canning guidelines for the modern cook. Sterilize jars, fill water bath canner, prep canning area and lids. Wash beets and trim tops to about 1 inch. Boil beets about 15 minutes to half an hour, depending on the size of the beets, or roast for 1-2 hours. Drain, cool and remove skins. Cut into bite size chunks or slices. Combine all ingredients except beets in a large sauce pot. Bring vinegar water mixture to a boil; reduce heat. Simmer 15 minutes. Remove cinnamon stick. Pack beets into hot jars, leaving 1/4 inch head space. Ladle hot liquid over beets, leaving 1/4 inch headspace. Remove air bubbles with a thin plastic spatula of chopstick. Remove jars from canner and allow to cool completely. Remove rings, wipe up any spills. Date and label jars and store in a cool, dark location. 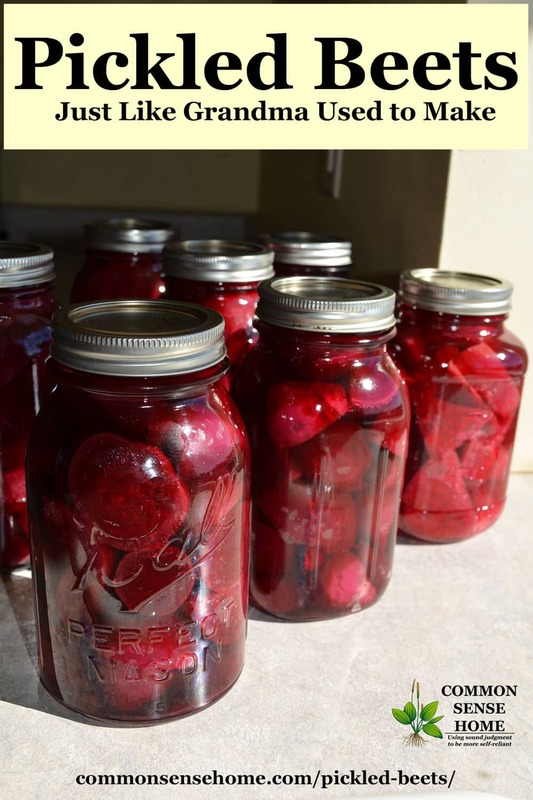 I hope you've enjoyed this recipe and will consider giving pickled beets a try. 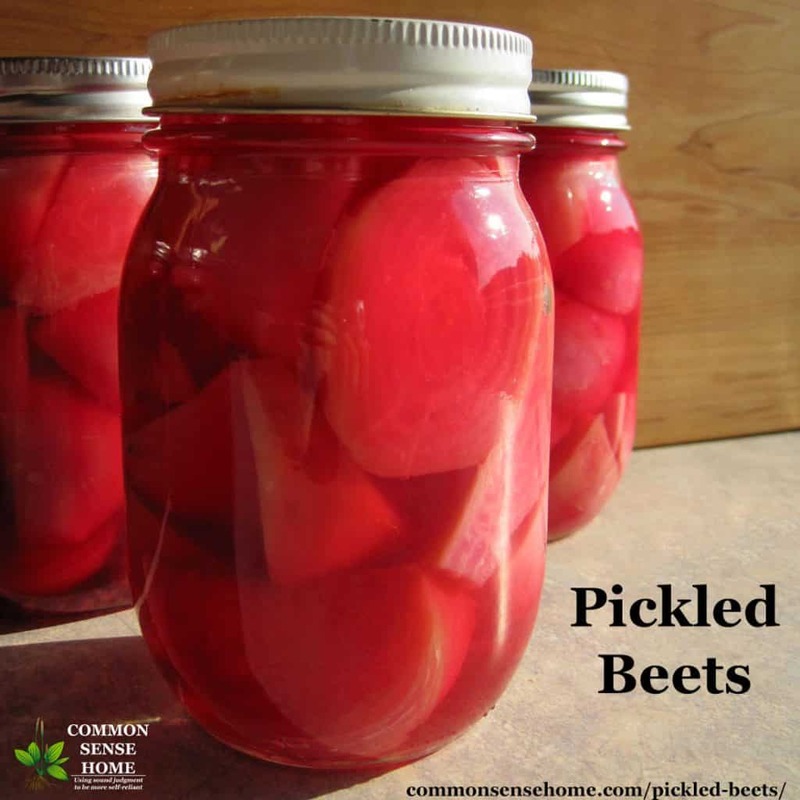 Compared to over $8 per quart plus shipping for some brands of commercial pickled beets, making your own could yield some serious savings. Sometimes we have the opportunity to glean farm fields for beets that were left behind by the harvesters. If you have beet growers in your area, you may want to watch for this, too. 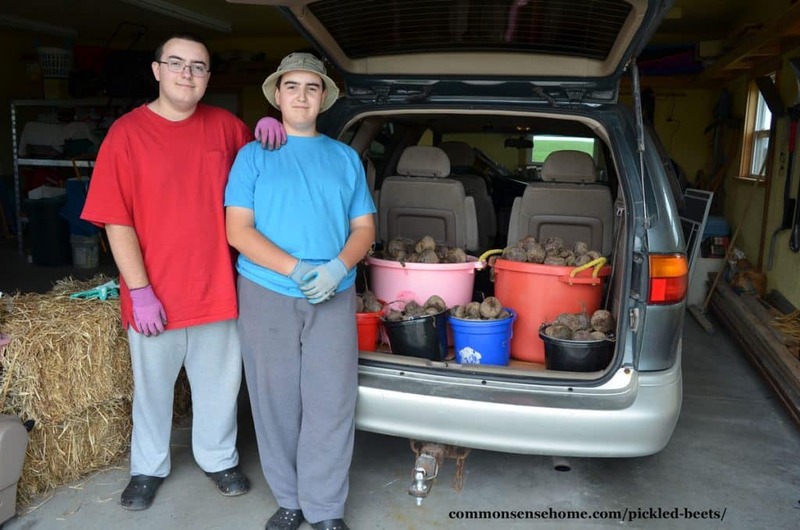 Here's a photo from a couple years ago where we filled the whole back of the van with beets. Do you have family canning recipes or stories that you remember from your childhood? I'd love to hear about them. No Can Dill Pickles – Just Stick Them in a Jar! Originally published in 2014, updated in 2018.
have you ever roasted your beets for pickles? It is wonderful, you don’t lose all your nutrients in the water,and they come out with very intense sweet flavor. I did this one year when a friend gave me huge beets, one was 4lbs, and will never boil them again. for the biggest ones I wrap them loosely in foil to prevent burning. Depending on size they may take 1-4 hrs to cook but it is worth the extra time. No, I haven’t, but given that roasted beets in general are pretty tasty, it sounds like a good idea. Do you serve these at room temperature, cold or hot? We always served them chilled or at room temperature. spice where do you get it and what is in it? You’ll find pickling spice blends sold in most places where they sell canning supplies, or online. Blends will vary. The Ball Pickling Mix contains mustard seed, black peppercorns, dill seed, cardamom, Cassia, ginger, coriander, allspice, chili pepper, cloves, bay leaves. I love when people preserve their grandparent’s recipes for old-world type preservation that may not be as popular as it used to be! I feel like pickling has faded away a little bit in this modern age, so I love that you are keeping it going and sharing it with the masses! Thank you for this recipe, I definitely want to try it at home! Hi Billy. Nice to see someone from Bubbies stopping in to my corner of the world. You folks have great products. I need to get back into more lacto-fermentation this year and expand beyond my big crock of sauerkraut. How many grams of sugar in Gram Irene’s Pickled Beets? There are 450 grams of sugar in the entire recipe, but not all of that will be absorbed by the beets.